Following Hall Street and Stolt-Nielsen, there’s been an “open” question as to whether a party can still challenge arbitrators’ rulings for “manifest disregard of the law” under the FAA. (I say “open” because I thought Hall Street made it pretty clear that “manifest disregard” challenges weren’t viable under the FAA.) Some circuits have held that “manifest disregard” challenges are still viable, while others say no deal. Last month, in Wachovia Secs., LLC v. Brand, the Fourth Circuit joined the fray, holding that “manifest disregard” challenges are still viable. So, where do things stand now? Well, I could write it all out for you, but that would get boring, so instead I’ll show you! 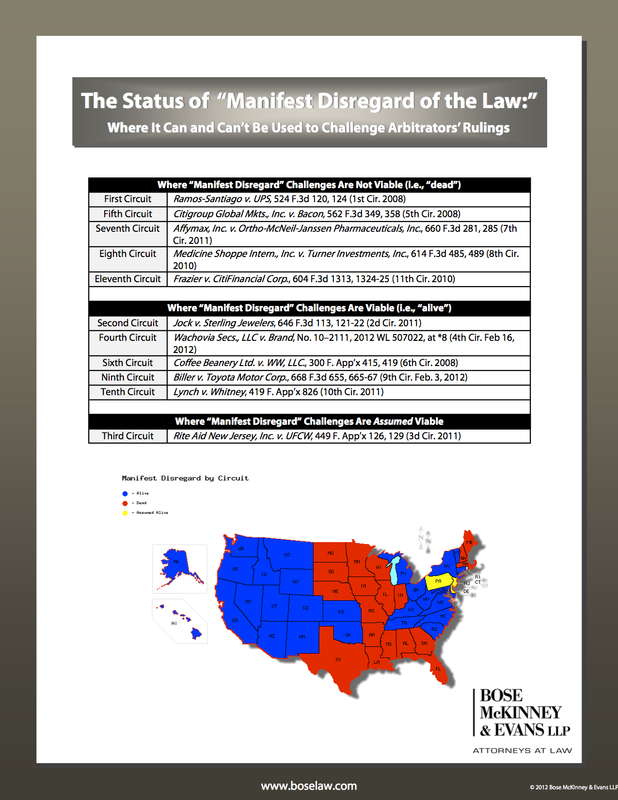 Here is our handy chart showing where “manifest disregard” challenges are and aren’t viable (click here for a printable PDF version). This entry was posted in Arbitration and tagged Arbitration, federal, Manifest Disregard of the Law. Bookmark the permalink.